﻿ Espanyol 0-2 Real Madrid. A well-oiled winning machine! 18.09.2016 » Espanyol 0-2 Real Madrid. A well-oiled winning machine! 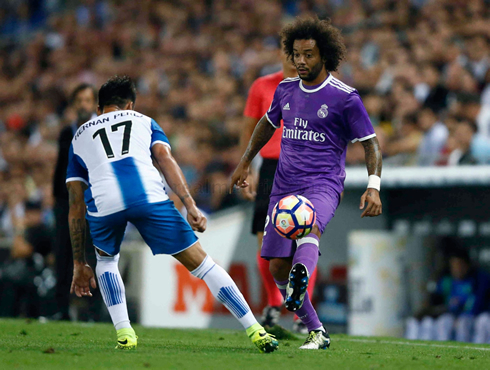 The trip to the Cornella El Prat was promising to bring up a lot of difficulties to Zinedine Zidane's men, but Real Madrid passed another test and beat Espanyol 0-2. James Rodríguez and Karim Benzema scored tonight's goals to make sure the Merengues will remain on top of La Liga at least for another week. The Merengues continue 100% victorious this season and their last victim was Espanyol, who they have beaten tonight at the Cornella El Prat by 2 goals without response. James Rodríguez with a stunning goal still in the first half and Karim Benzema with a good finish later in the second, carried Real Madrid to their 16th consecutive win in La Liga, and now share the record with Pep Guardiola and his Barcelona run years ago. Cristiano Ronaldo and Gareth Bale were the two major absents tonight, but according to most betting apps and bookmakers, that didn't make Real Madrid less of a favorite going into this game. The Portuguese caught the flu days ago and the Welshman found himself still struggling following a knock he suffered against Sporting CP in the Champions League opening fixture. A trip to Barcelona to take on Espanyol is never an easy fixture, but under Zinedine Zidane, Madrid have made a habit out of making sure that easy fixtures never became tricky ones and today was more of the same. Goals from James Rodriguez and Karim Benzema were enough for Real Madrid to cruise past Espanyol in a 2-0 win. Espanyol have been impressive this season in the league despite their lack of victories. New investment this summer has seen them bolster their squad and they certainly didn't make things easy for Madrid, especially in the first half. Kiko Casilla, on his return to a place he called home for 8 years, was called into action a few times. However there is a scare, Casemiro, a player so essential to everything Madrid does, was injured and had to come off in the first half. It remains to be seen how severe the injury was however. It wasn't until the end of the first half when Madrid would take the lead, with James Rodriguez riding two challenges at the edge of the box before blasting a low hard drive into the corner of the net. It was a fantastic goal for the Colombian, who seems very happy in Madrid. In the second half, Real Madrid would take more control and eventually Benzema would net the second from a low cross for 2-0. As we prepare for Villarreal, it's important to put things into context. Real Madrid haven't lost since Wolfsburg. Seriously think about that. This Zidane team is something else. Madrid is about to pass Pep Guardiola's record in consecutive wins from back in 2010-2011 and it feels like we still have so much more to potentially improve on. The team is DEEP, the players are all happy to be a part of the team. He's rotating well. He's even getting Ronaldo to rest more. His record as coach is 28 wins 2 losses 3 draws. He's beaten Barça, Manchester City, Atletico Madrid in the process as well. Attackers: Lucas Vázquez, Marco Asensio, Benzema. Cristiano Ronaldo next game for Real Madrid is for La Liga on September 21 of 2016, against Villarreal. You can watch Juventus live stream, Real Madrid vs Villarreal, Barcelona vs Atletico Madrid, Leicester City vs Chelsea, Nottingham Forest vs Arsenal, and Wolfsburg vs Borussia Dortmund, all matches provided from our streaming football game pages.